The payouts for video slot machines are in no way universal for all machines. On the contrary, each machine has its own payout table that is usually placed on the machine's front or - as in modern video slots - on the different screen available by pushing the button or pressing the touchscreen. Before actually playing it is important to consult the slot payouts table in the first place to choose the best machine for you. Slot machines of all types are actually seen as games of mere chance. The reason for this is a totally random character of each spin of the reels - either mechanical or graphically simulated reels of the video slot machines - which makes every spin an independent trial. Thus the results of each spin have nothing to do with the previous or future outcomes, especially as each slot machine works by means of a special computer program known as the Random Number Generator (the RNG). Each slot machine comes with a special microchip installed in it with a special program that defines the whole work of the machine - the RNG. The RNG is a perpetuum mobile that generates thousands and thousands of random number every given second. These numbers actually define the outcome of every spin of the slot machine's reels. The very moment you push the "Spin Reels" button, the results are already determined as the RNG has already chosen the numbers corresponding to the certain symbol combinations that will come out on the reels when they stop. All this means that every given spin of the reels has equal chances to hit the winning combination or to lose and it is impossible to foresee or to change the results. Modern advanced video slot machines offer a whole set of special features that influence the payouts dramatically. 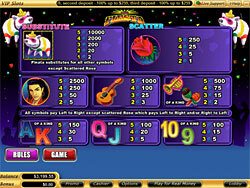 Most modern video slots have more reels than the traditional mechanical reel slot machines. Usually the machines have five reels, but there are advanced models featuring seven and even nine reels. Besides, most modern video slots feature more than one payline - sometimes from 25 to 50 and even 100. Each reel of the video slot machine may accommodate 20 to about 100 symbols. All this makes the number of possible winning combinations of symbols increase tremendously. All video slots offer a great variety of special extra features like bonus games or "wild" symbols that also make video slot games more profitable and attractive to the gamers. Nevertheless it is important to remember that the increased number of winning combinations results in the fact that lower paid combinations will come out more frequent than the higher paid ones, even though the overall frequency of hitting the winning combinations will be higher with video slots. Besides, to win the highest jackpot one is required to bet maximum coins on maximum paylines. Otherwise it is only possible to get low even though more frequent payouts.